The C Table - Is the "C" for Couch or Computer? You've just got to love it when you realize you have all the materials you need to build something you've wanted for a while. Such was the case when I came across 4 black L-brackets in my "junk" drawer- just what I needed for the laptop table I wanted for the farm house. I had picked up two trim boards (1 x 4 x 8') from a collection of gray shiplap specialty wood from Home Depot, just because it was good looking and may come in handy sometime. It's hard to find real barn wood that has weathered to a natural gray. Many years ago I was gifted with a nice slab of cherry which I had been saving for a special project. Now with the L-brackets, it was time to put something together. Cutting the wood- There are 3 considerations when designing a C-Table for yourself. The height of the legs was determined by the height of my couch arms. It turned out they were 25.5" from the floor, so I cut my 2 leg pieces out of the gray wood 27" (measuring from the couch arm height, plus the 1.5" for the top frame support, minus .75" for the "feet", plus .5" for clearance and rounding up. It's important to measure the space between the floor and the couch- you want to be able to slide the table under the couch frame. (Mine was a scant 2", but 1 x boards (.75") worked fine.) The third consideration is the size of your top- the feet should be as long as the top minus 2". The width of the cherry determined my table top width and I cut the slab to a rectangle which I thought was the appropriate dimensions (16" wide x 24" long). If you're using wood you have on hand, you can make the top any size you want provided it won't become too heavy. I think something like butcher block would be too heavy for this style C-Table. I like to sand all my cut pieces before putting them together. It's easier to get the little wood bits off. Each "foot" was attached to a leg from the bottom with glue and counter sunk screws. Countersinking prevents the screws from scratching the floor and provides a strong joint. I attached the L-brackets at this joint about 1" in from the outside. Two other L-brackets were then screwed to the legs and tabletop. Since the gray board was stained and once it was cut the wood was raw, I diluted some gray paint I had on hand- paint to water ratio about 2 to 1. With a small brush, I stained any raw edges and any chips from the cut ends. With black craft paint, I camouflaged the silver screws on the L-brackets. I used mineral oil to seal the top. That really brought out the beauty of the wood. The feet were a little pigeon-toed so I added a block of wood to straighten them out and put felt pads on the bottom so it could glide when being moved. And that's it- easy-peasy! It's a quick, inexpensive project- fun to build and useful. If you would like to be on our mailing list and receive DIY plans in your inbox, REGISTER HERE. One thing that's definitely permitted is that girls can change their mind. The farmhouse came with a utility room- 7.5' x 7.5', which is not a whole lot of space, but fit a washing machine, furnace and freezer. I didn't need a freezer and the furnace was on it's last legs so once they were gone, the room was dubbed the laundry. Upon close inspection, the washing machine that came with the house was a little cruddy, so I got rid of it, too. In the interim, it's become a catch-all room. I've started to think of this space- this teeny, tiny space- as a craft room. But this required organization! From my scrap wood pile, I was able to pick 2 pieces of remnant shiplap, one about 36" and the other about 32" long. This would be perfect for a backer board and shelf- a way to get the brooms and mops off the floor and hang a myriad of other stuff. When shiplap is applied to a wall, one board is placed over the other, creating a solid surface. The back of the shelf (backer board) would be the 36" piece but the "lap" had to be cut off. I ripped it on the table saw so the bottom of the wall part of the shelf would be flat with no tab (save the lap for later). One lap from the 32" piece- the shelf- was also removed and this board was ripped to 4" wide. I made a paper pattern for the shelf brackets and traced it onto a scrap piece of 1 x 3 board. I cut out 2 brackets with a scroll saw. I love to sand all pieces before attaching them together. I also use the sandpaper to take the sharp edges off the pieces. Depending on how light or strong you sand, you can distress the edges to appear worn. After sanding everything I had cut, as well as the ends of the backer board and shelf, I started to assemble the pieces. It's not always convenient, but in this case I was able to mark my nail lines on the back of the wood backer board. A nail gun makes it easy to attach the shelf to the brackets from the top, then from the back attach the shelf to the backer board. The last step was to fill in behind the top lap with the lap I first cut off. I glued and nailed the lap fill in the back of the top of the backer board. I gave it a quick coat of interior semi-gloss enamel which when dry, allowed the wood grain to show through. Because I wanted to create a farmhouse made-from-necessity look, I wanted flat nails for the hooks. Amazing even to myself, I found a coffee can of nails in my stash which I had bought for a project about 20 years ago and thought they would be perfect. I pencil marked the backer board every 2.5", 3/4" from the bottom edge for where I wanted the nails to go. The nails are very thick and without a starter hole, they'd rip the board. I tried pre-drilling with a bit, but when I reversed the bit direction, it pulled the wood out. I ended up screwing a sheet rock screw about half an inch deep at every mark- I found screwing and backing out the screw was the cleanest approach. I pounded the nails until I could feel from the back side that they were just about to tear through. When I mounted the shelf onto the T&G (tongue and groove) wall boards in the craft room, I gave them 2 extra hits to settle them into the wall, slightly- then they seemed tight. I had found a horse shoe in the yard and thought with the flat nails, it would be a good finishing touch. You can never have too much good luck! So there you have it- a wall shelf that holds brooms, mops, tools, and just about what ever was floating around the floor previously. Combined with the wall shelves I made last week, the room is pretty organized and I couldn't be happier with the farmhouse made-for-necessity-style shelf! If you would like to follow along with the farmhouse renovation and receive DIY projects in your in-box, please register HERE. Maybe it's the surge of energy we feel in accordance with the flowers and trees all coming to life, but spring makes us want to give our homes an update. Home improvement is never wasted, especially when you can make a dramatic improvement for little investment. Faux wood paneling is so 60's.. or 70's... or 80's but a lot of us still have it. It's a big job to rip it out- you just never know what you'll find underneath- but I have an easy fix. I had removed the closet which left a hole in the ceiling. The floors were concrete and covered with cheap vinyl tiles which were also removed. And the walls were old, dingy paneling- not just one type pattern, but 3- a different style inside the closet, 1 on the majority of the walls and 1 other which I added to cover holes. What a hot mess! The first challenge was to unify and beautify the walls which I did by painting 1 coat of an oil based primer and 2 coats of white, flat wall paint. I applied the paint with a roller, then brushed over it by hand to give a more dimensional finish. I didn't bother to paint up to the ceiling since I was going to add a wainscot effect to the top of the walls. I'd been successful before, in my home kitchen, transforming paneling from old and tired to farm style and I did it with wall paper underlayment. The bottom of the paneling is painted to resemble tongue-and-groove boards and the top is covered in underlayment which dries so smooth it looks like sheetrock. Trimmed with crown molding on the top and cove molding on the bottom, it gives the illusion that the bottom paneling has been applied to a sheet rocked wall. This is a new version of wainscoting. Underlayment AVAILABLE HERE is a thick wall covering originally used to smooth out cinder block when painting a basement. The paper is thick, and when dry, spans cracks. It comes pre-pasted so it's an easy application- kind of like wall paper borders. If you haven't done pre-pasted paper before, CLICK HERE for an easy tutorial. I ran it on the horizontal and used the width of the paper to determine the height of my "chair rail". Using a darker paint color on the top of the rail (in the case of my kitchen, a light gray) and finishing with architectural moldings gives a professional and deliberate look. You can also wall paper over the underlayment for a totally different design influence- a floral paper would bring a more classical vibe, country pattern more country, etc. I ordered enough underlayment so a continuous piece runs from corner to corner (no seams mid-wall) and painted the lower paneling before applying the underlayment. I used a level to pencil mark around the room so the bottom edge was straight even through my ceiling was a bit wavy. You have some play with this as moldings will be added later which cover the top and bottom edge of the underlayment. Going from corner-to-corner in a 14' room and working with such a long piece of paper was a bit tricky because it is heavy and did want to come down before I got it level. I had chairs and ladders set up so I could jump from one to another AND in a few places I gave it a staple at the top to hold it in place while I smoothed it out. I figured molding would cover the staples later. I usually work on projects by myself so this was a handy solution. You've heard of the one-armed paper hanger?... Once you have the underlayment attached, let it dry over night before painting. In the bedroom I used 1 x 4" pine boards as trim which were drilled out for wooden pegs to finish the bottom edge of the underlayment . 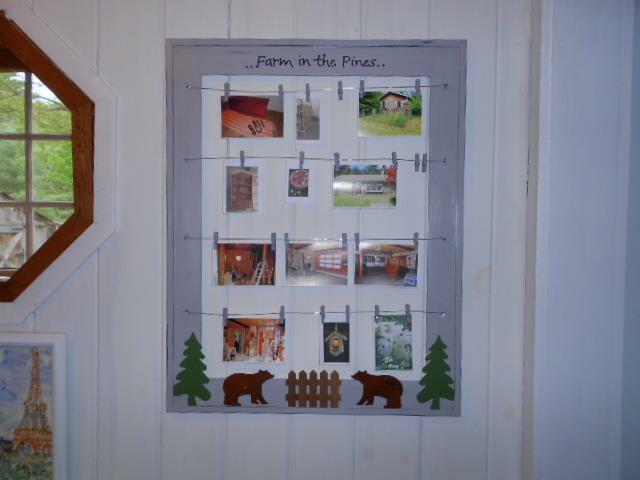 It's a "farmy" finish and helpful for hanging bathrobes, purses and hats. Quarter-round was added in the corners above and below the trim pieces and painted to match the walls, covering the panel seams and making the corner moldings almost invisible. It's a little job for such a big impression- totally do-able for one person and a cozy, comfortable decorating change. Feel free to forward to a friend who likes home decorating, gardening and other DIY projects. Thank you! One of my winter hobbies is to try and find practical uses for the stuff that accumulates– you know what I mean- stuff that you really don’t need or want but can’t throw away? In the DIY (Do It Yourself) world, it’s called up-cycling. I started with a 24” x 30” black picture frame and thought it could be repurposed into an inspiration board with clothes pins (I had some very small ones) and wire to hold pictures. I got rid of the glass and backing, painted the frame gray, and drilled small holes on the sides and strung the wire through, stapling it on the back. I thought it was finished, and I was just to the part where I was going to paint my farm name on the frame when I decided I didn’t like it. It wasn’t beefy enough- neither country or rustic, industrial or contemporary. It just didn’t please me– and so it sat for several months, hung on the wall, undone. Finally, all the parts came together. To make it a little bolder, I changed out the clothes pins to larger, gray stained ones and used 5/8” eye hooks on the front, instead of threading the wire through to the back. With just this small change, the frame looked more substantial. I remembered I had some wood cut-outs and was delighted to find they could be combined to depict a scene from the area near my farm. These would work to lend some color and design to the piece and give it a folk art feel. I didn’t fuss too much with the painting. I gave it a “Grandma Moses” flat finish with no shading. I used hot glue to attach the decorations on the bottom of the frame. I like it now because it relates to my farm experience. I’ve seen 2 bear cubs about 2 miles from my house! For me, it’s handy as an inspiration board– I just clip photos from the internet of projects I want to do, sometime. But for Grandparents, it’s a fun way to keep the most recent snap shots of the grandkids, knowing you’ll want to change them out frequently. Decorated for Christmas, it could hold your most beautiful Christmas cards. Maybe as a holder for get well or birthday cards for someone who likes to be surrounded with well wishes?